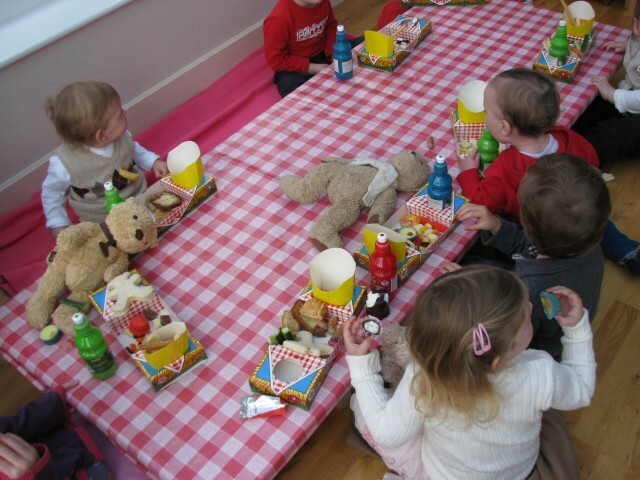 When my daughter turned 3, we decided to have a Teddy Bear’s Picnic party. She has loved her bear since very young and it just seemed a really cute and simple idea for her. 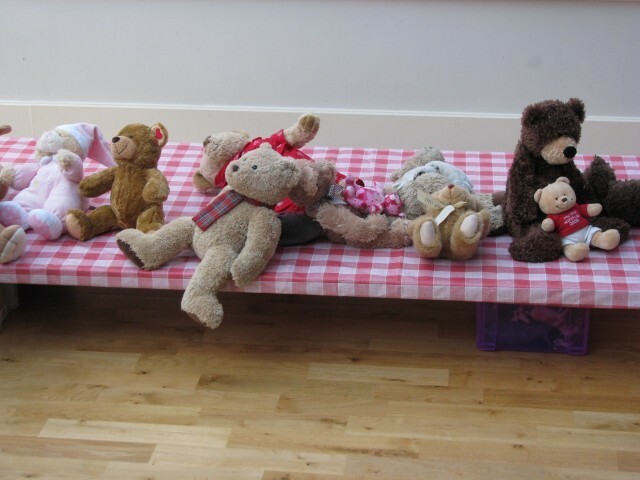 I asked all her friends to bring their bears so that it really was a teddy bears picnic and to ensure we had enough bears for the games I wanted to play. 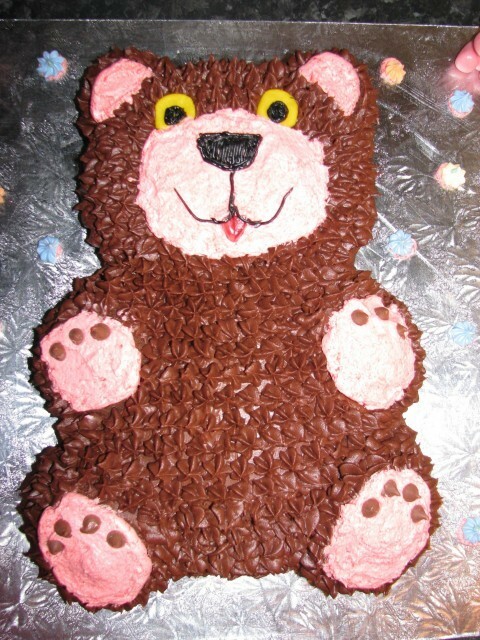 I baked a chocolate cake in a bear shaped tin ( I hired one from the local craft shop) and decorated it with buttercream icing. Each child had a mini picnic basket box with a drink in it-bottles to help minimise spilling- and space to fill with sandwiches, sausage rolls, vegetables and other treats. 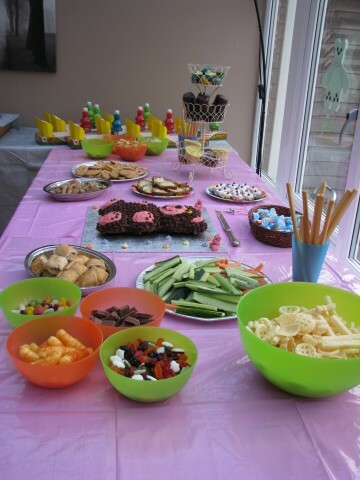 Because all the guests were so little , parents stayed, so I provided snacks suitable for both toddlers and adults. There was a drinks station including tea and coffee in the kitchen which is open plan to the conservatory..so right near the food table. 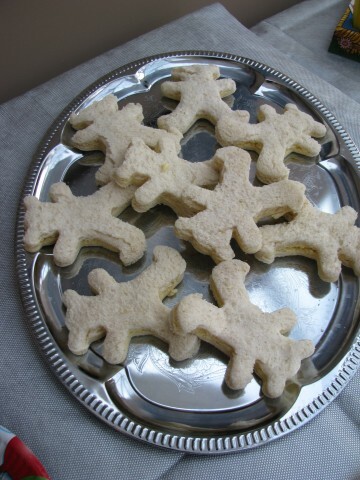 I used a bear shaped cookie cutter to cut out bear shapes from sandwiches. I filled them with cheese, jam, or ham. 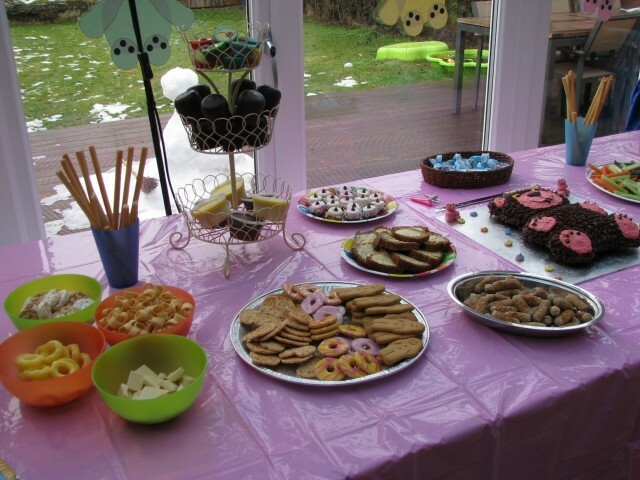 There were loads of sweet and savoury treats to eat as I was catering for parents and kids. Parents filled their child’s picnic box with whatever they felt appropriate as there were children age 6 months to almost 4 years old in attendance. It was winter (you can see snow melting in the garden in some of the pics) but our conservatory was lovely and warm. 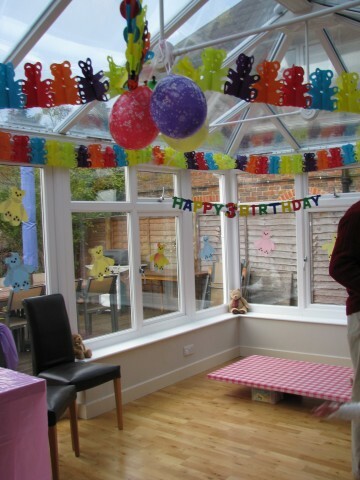 I used bear shaped streamers/bunting and strung that between the supports along with some pink and purple balloons. I printed out a lot of copies of a teddy bear colouring sheet onto a variety of pastel coloured paper and then cut them out. Those I stuck to the windows. 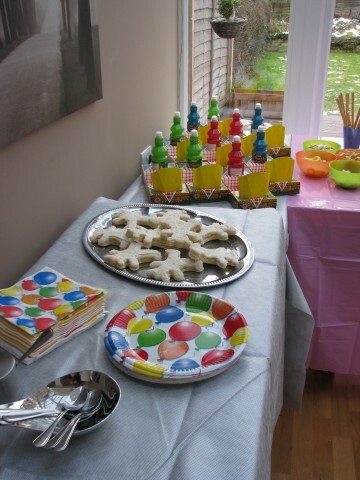 I also found all our teddies and placed them around on the couch, window sills and tables. 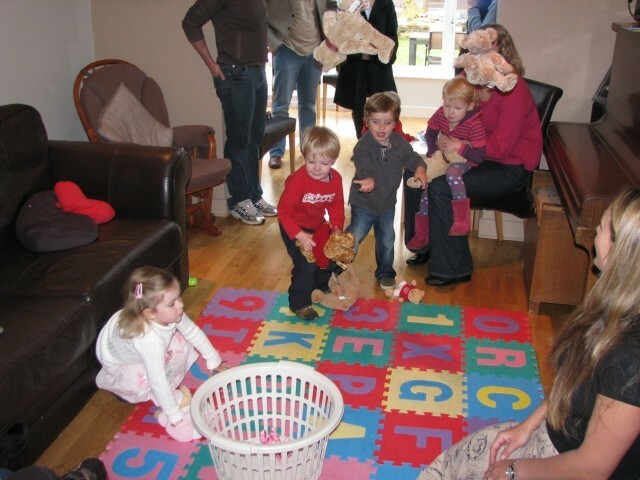 We played “Toss the teddy into the basket”. We did a few rounds and varied the distance from which they could throw. I had made a pile of soft toys belonging to my daughter so that they could have lots of throws, not just their own bear each time. I love how there are two bears flying through the air in this picture. Playing bear bounce, how high can we make them go? I covered an old door with checked gingham red and white vinyl table cloth (easy to wipe clean) and raised it on low boxes. I was going to put it directly on the floor but this proved a better way to control what was food area and what was feet area. I always find children walk on each others plates when they have a picnic! This defined the eating space and I had no need for chairs as they all sat on the floor or cushions. Much better with small children as you don’t need to fuss about them falling off! 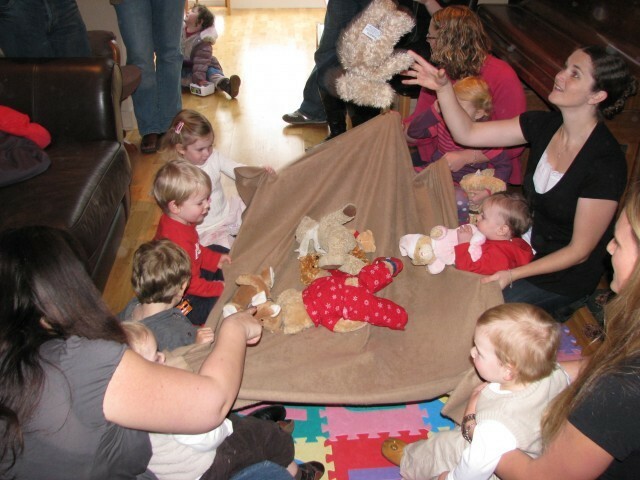 Then we sat our bears on our laps and played pass the parcel. The final prize was a bear book. 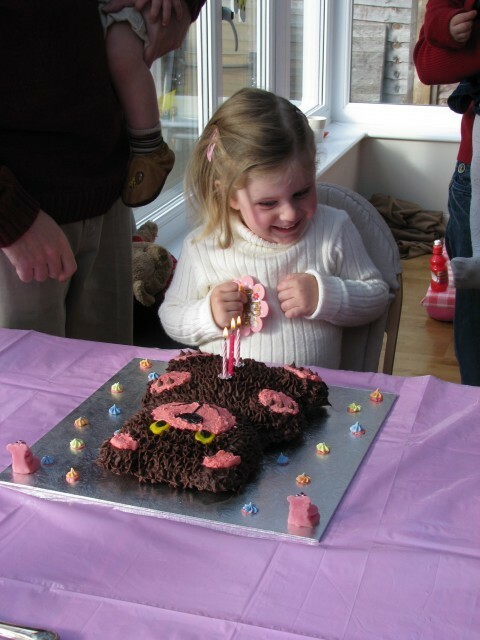 It was time to blow out the candles on her teddy bear cake. I love the expression on her face! 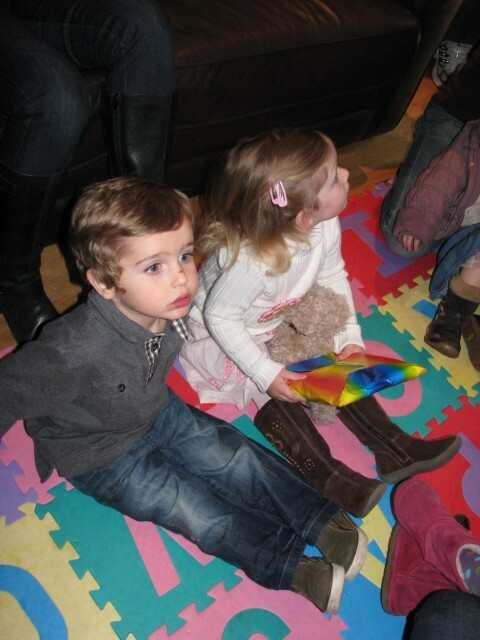 Each little guest got a tiny soft toy bear and a bear themed story book in a drawstring bag to take home when they left. 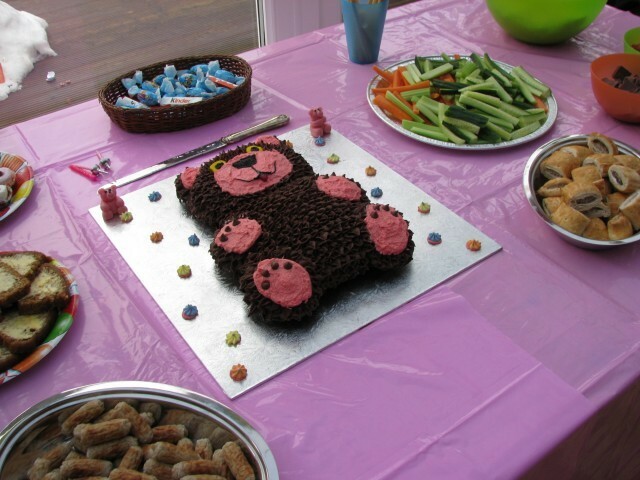 I hope this has inspired you to throw a teddy bears picnic for your child! Please let me know if you use any of these ideas by commenting below.